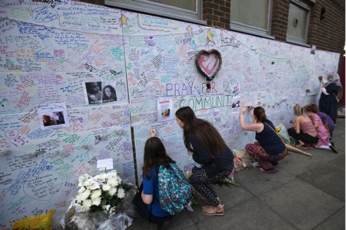 On Wednesday 14th June 2017, the community of Ladbroke Grove were awoken by the shock of a devastating fire that had engulfed Grenfell Tower, a resident tower block located in the heart of the community. Also located at the heart of Ladbroke Grove is Latymer Community Church which sits at the foot of Grenfell Tower. Many of the church congregation live in the local area and so, on hearing the extent of the fire, were required to evacuate their homes in the early hours of the morning. Seeing the extent of the tragedy before them, despite being few in number, the congregation chose to respond. The team opened the doors of the church to simply provide a refuge for those effected by the tragedy giving people physical and pastoral care where needed. Throughout the day, the church doors remained open as the team partnered with local community centres, churches and mosques to help meet the increasing need of their community. The team put up a prayer wall on the side of the church building to give everyone the opportunity to respond, grieve and pray. The image of the wall full of prayers and tributes soon became an iconic image for the response from the community to the disaster. Latymer Community Church, on the Sunday after the fire, held an open air service that was attended by hundreds of people from the community and neighbouring cities. During the service, fire fighters who had been working around the clock, were cheered and applauded as they passed through service; a moment which was broadcast and publicised by many mainstream news outlets. We are so touched by the impact that Latymer Community Church and their members have had on the community and the nation through the love and care they have shown. They have shown the impact that we can have by remaining faithfully present in times of difficulty and distress. Light will always dispel the darkness, no matter how deep the darkness or how small the light.